Cryptorbit is considered to be a ransomware infection because it pushes you to pay a ransom in return of the promised file decryption. Unfortunately, the malicious computer infection is not trying to fool you into thinking that files on your personal computer are encrypted, as it actually does corrupt these files. According to our researchers, the clandestine threat can take over .doc, .pdf, .jpg, .xls and other type of files on your computer, which is why you may think that paying the requested sum is exactly what you should do. Hold it right there! 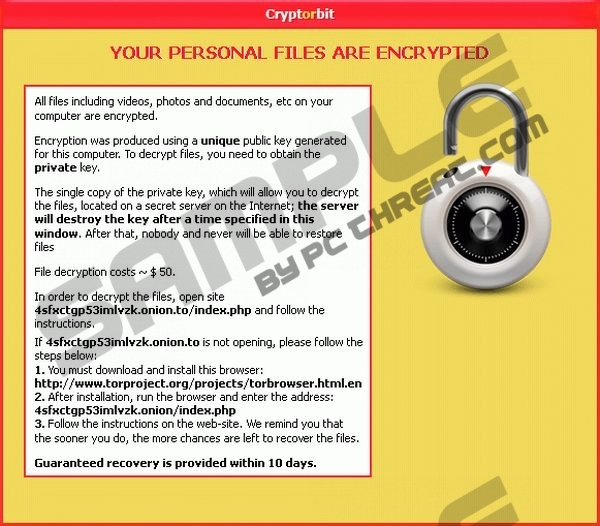 Even though your files may seem encrypted, in reality schemers controlling the ransomware can only modify them, which means that there is a chance you could save them from permanent removal. Continue reading to learn more about Cryptorbit removal. All files including videos, photos and documents, etc on your computer are encrypted. You may be asked to pay from $50 to $500 (and up) for the decryption of your personal files; however, these sums are completely inadequate. If you pay the money, the malignant files related to the devious ransomware may remain running, and this may lead to further dangers. Therefore, we recommend that you ignore the payments and install reliable recovery software which may help you restore the files. Note that many of these programs will require you to have a restore point. We also recommend installing authentic security software which could detect and delete Cryptorbit components. Click the download button below to acquire a legitimate malware detection and removal tool which will delete discovered malware and will help you keep the operating system guarded against schemers’ attacks in the future. How to decrypt files on your Windows system? If you have had a System Restore point set prior to the invasion of the malicious Cryptorbit, it is possible to decrypt files without installing allegedly beneficial decryption tools. With System Restore active on your operating system, Windows can create shadow copy snapshots. Even though there are no guarantees that this will work, it is your best chance if you do not want to use the services of third party software. Follow the guide below to attempt file decryption. Right-click on the encrypted file and select Properties. Now click the Previous Versions tab. Select the version of the file you wish to restore. Quick & tested solution for Cryptorbit removal.